Paid admission to the Museu Tauri in Barcelona allows you to explore this former bullfighting arena. 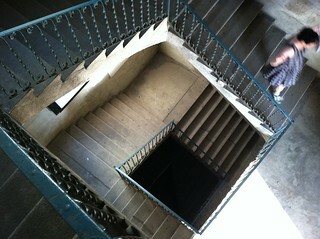 We climbed up these “Vertigo” stairs to wander around the upper deck seating area. I blogged about the museum on my Eurotrip site. This is my entry for this week’s Photo Sunday Challenge: Stairs.